We arrived at Scottsdale and checked into this hotel. I don't recall what we did that night (funny how a couple of weeks pass by and it all becomes a blur), but we had a nice breakfast the next morning (breakfast and happy hour were included). On our first full day there, Vic, my dad and I headed out to Frank Lloyd Wright's winter home. http://www.franklloydwright.org/ It was some of the most interesting 3 hours I have spent on a tour, right down to the tea/snack they served us while listening to one of Frank's former students who is now in her 90s and still lives at Talisen West. I highly recommend visiting here. It is also in a beautiful spot, so even if architecture doesn't interest you too much, the surroundings in the desert will. The home is located at the base of the McDowell Mountains. 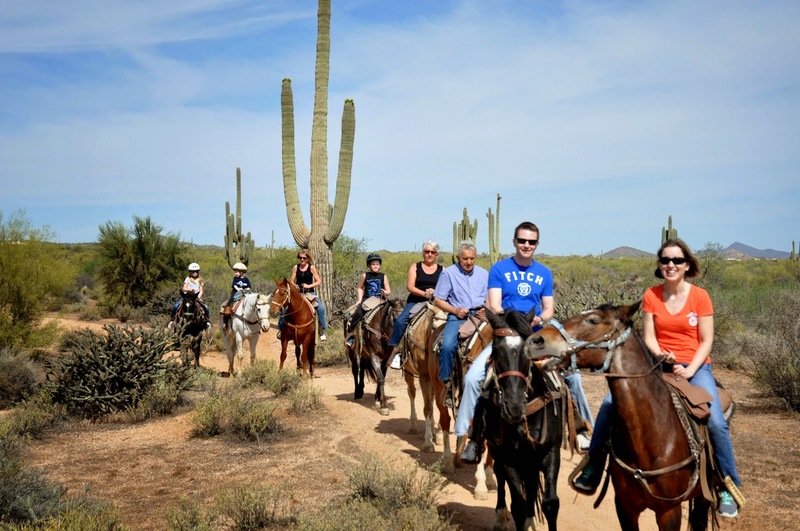 On our next day, I had booked horse back riding with Cave Creek Outfitters. Since there were 8 of us, they assigned two "wranglers" to our group. Everyone did very well, including Fynn and his cousin who had never been on a horse before. It was the closest we got to seeing the desert "up close" so that was really neat. We were hungry and hot after riding for a couple of hours so we had lunch here for cold drinks and burgers.